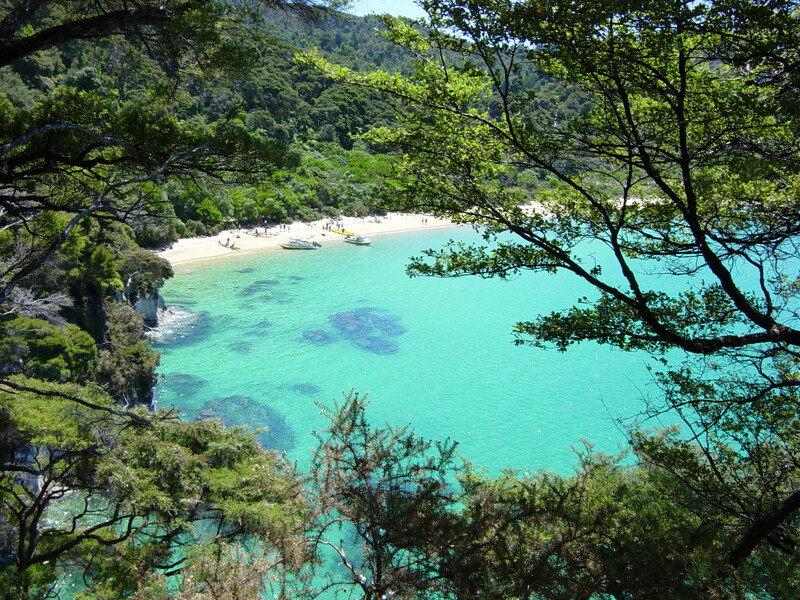 Turquoise blue water from Tasman Bay surrounding you, gentle waves splashing in the distance as they come up on the beaches, feeling the soft sand between your toes, a slight breeze in the air as the warm sun beats down–you’re not in Kansas any more, you’re in a paradise called Abel Tasman National Park. 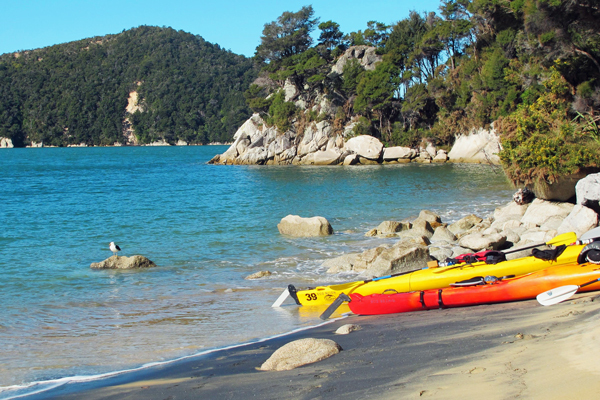 One of New Zealand’s finest coastal National Parks, Abel Tasman may be the smallest park but it’s a gigantic playground for adventurers and those looking to turn-off from the rest of the world and relax. At Able Tasman, it’s up to you to decide the adventure–whether you want to take a day trip, or use several days to explore the park. You can choose from one day pass, three day pass or five day pass. The Able Tasman Coastal Track is 32 Miles (51 Km) long and perfect for walking, but keep in mind this isn’t a circuit track and you’ll need other forms of transportation at either end of the trail. You can always switch it up and decide to sea kayak some of the trail for whole new experience! Though there are no kayak rentals on the national park, you can arrange for a rental before you enter the park. Or, you can check out the awesome full-day and half-day guided kayak tours here. Whether you want to adventure off into the park, take a boat tour and watch the dolphins swim alongside, kayak with seals, beachcomb, explore the parks natural flora and fauna and wildlife, there’ll be something for all types of vacationers to enjoy. At AAV Travel we really love to work with Clare & Peter at the The Resurgence Luxury Eco Lodge. This luxury boutique property is a great home base for active couples who enjoy good food and nature. Set in 50 acres of wilderness with 5km of bush tracks it doesn’t get any more luxurious close to the park. The Resurgence offers rooms at the main house, or if you love privacy, luxurious stand alone cottages. Clare & Peter offer several packages including food and activities and will go out of their way to help you create the experience perfect for you. 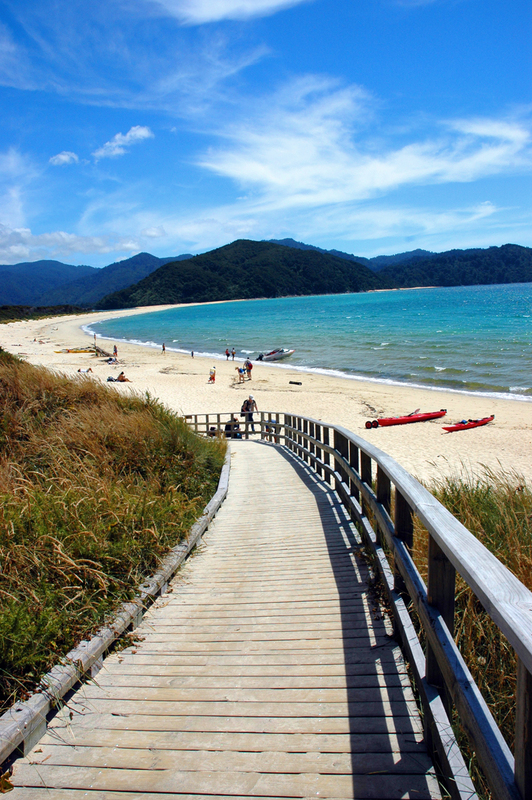 Activity options include day trips to Abel Tasman (hiking and kayaking), hiking to nearby Mount Arthur, a visit to a winery and much more. When you get home from your explorations and are ready to relax you will find a hot tub and salt water pool, gym and yoga area. You can also get pampered with massages, reflexology, reiki, facials and aromatherapy from their on-call therapists. Have you ever gone kayaking or boating and you wanted to bring your phone and wallet with you but you just didn’t know how to keep it dry? Have you ever taken your phone out then a wave hits your kayak and you drop your phone…and it’s gone to its watery grave? If you found yourself saying yes to these situations, or have been in similar ones, then you know you’re fed up with having to purchase new phones when something like this happens. Whether you’re an avid adventurer or new to water activities, obviously you’ll want to take photos or videos to capture your experience. For $30 plus shipping you can get a waterproof case from Epic Kayak that allows you to store and use your phone in the bag. The bag is waterproof up to 30 M (100 ft) and the magnetic strips won’t interfere with your phone or credit cards. If you don’t feel like spending money on a waterproof bag, you can always go the el cheapo route and use a Ziploc bag. It’ll keep 99 percent of sand and water out and you can still use your phone’s touch screen through the plastic. Ever go on vacation and realize that you’ve gained a couple pounds when the button on your jeans doesn’t seem to want to…well…button? This can be the case for many travel-goers when their sweet tooth gets the best of them. But have no fear, you can still satisfy those cravings on vacation and still fit into your skinny jeans. Here’s a look at a how to indulge in one of the most mouth-watering places on earth and keep the weight off. When walking around in Rome you’ll never have to worry about finding a place to eat–every corner, every street there’s either a family run pizzeria, café or restaurant at every turn. Your taste buds will be satisfied at every meal with Rome’s simple, yet sophisticated recipes. Restaurant Spirito DiVino: A family run restaurant where their passion for food shows with every taste. The cost per meal ranges from 24 to 40 Euros ($32 to $53). The four-course dinner has many delicious dishes to choose from; start with the deer bresaloa with salad, grapes and nuts as an appetizer. As your first course, the half rigatoni with white ragu sauce of mixed meats. For the main dish, try the grilled t-bone steak served with creamy mustard and salad. If you still have room after that, the creme brulée will sure hit the spot! Oh, there’s also a wine cellar that holds about 5,000-7,000 wines. You can buy from the glass (6 to 15 Euros/$8 to $20) or the bottle (16 to 800 Euros/ $21 to $1,068)–bring out your inner wino! 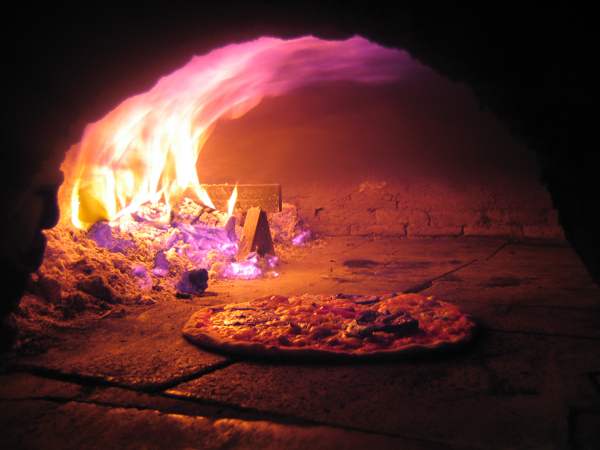 Li Rioni: Located near the Colosseum, this small, charming little restaurant is where you’ll experience the best pizza in your entire life. The heavenly first bite: the crunch of the thin crust, then the sweet Italian sauce, the melted cheese and then toppings of your choice–all the flavours mixed together so delightfully that you’ll never want to eat anywhere else. A perk: it’s very, very inexpensive. 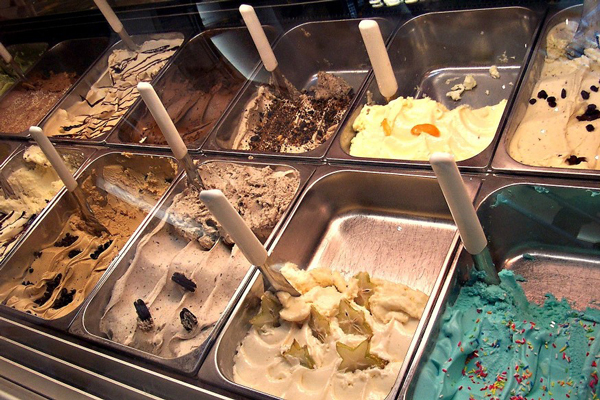 Bar Pompi: Where the gelato is not just ice cream–it’s an art perfected from the ancient recipe by Guiliano Pompi. At Pompi, expect nothing but the freshest fruits and natural flavour. Keep in mind: gelato in Rome is very costly and can definitely break the bank a lot quicker than expected. Prices vary place to place, but expect to pay roughly 13 Euros ($19) each. If you’re worried about adding on extra pounds due to indulging in the savoring tastes of Roman cuisine, you can still eat all you want and get a workout while on vacation. There are many options that you can consider while away. LivItaly Tours: A different kind of tour service–get to experience the city history, architecture and landscapes while out for a group run. Not only do you get to enjoy the sites, you’ll learn about each place and get fun facts and the best part — you’ll be burning off calories while doing so. You’ll get to enjoy every minute of your vacation even if you’re working out. There are various tours to choose from that range from 29 Euros ($39) to 89 Euros ($118). Moves Fitness Center: If you’re into the more traditional workout routine, there’s also fitness centers located in Rome. They have weights from 1 to 42 kg, treadmills, ellipticals and the typical compound and isolation machines. There are also different types of classes offered, such as: Pilates, yoga, body sculpting, aerobics and total body workouts. Walking, Jogging, Running Routes: This website specializes in routes created by locals and people from all over the world. You can search the different types of routes (walking, running, jogging, cycling) and even create your own route to share with other people. All routes vary in length and are all over the city. You can even search upcoming events that are happening–maybe you’ll participate in a 5 km! There’s no need to worry about packing on the pounds while on vacation. 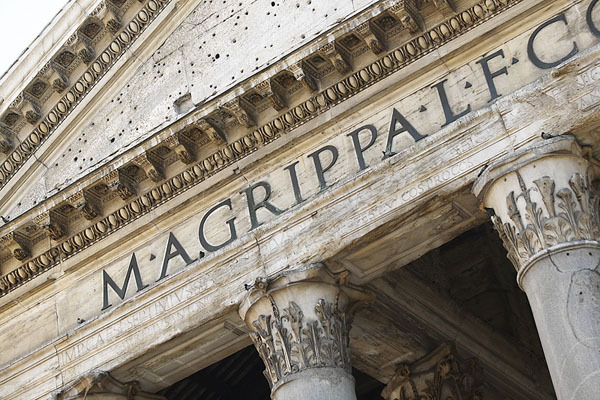 You can enjoy all the delicacies that Rome has to offer while staying in shape. You won’t need to buy gym memberships when you get back home if you exercise to make up for stuffing your face the day before. 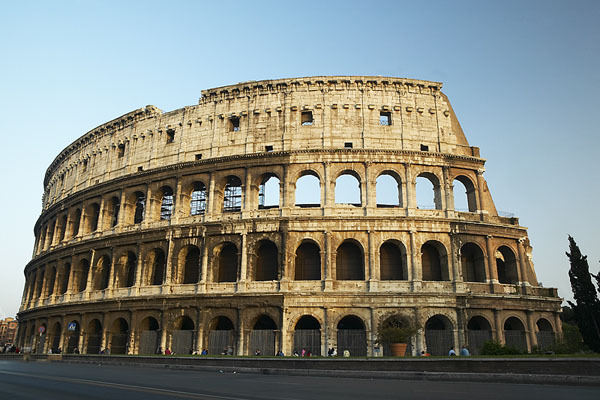 Working out doesn’t have to feel like a nuisance–and it certainly won’t when you’re running by the Colosseum! Don’t let yourself say “should I really eat that?” because chances are this is a once in a lifetime opportunity, enjoy it. 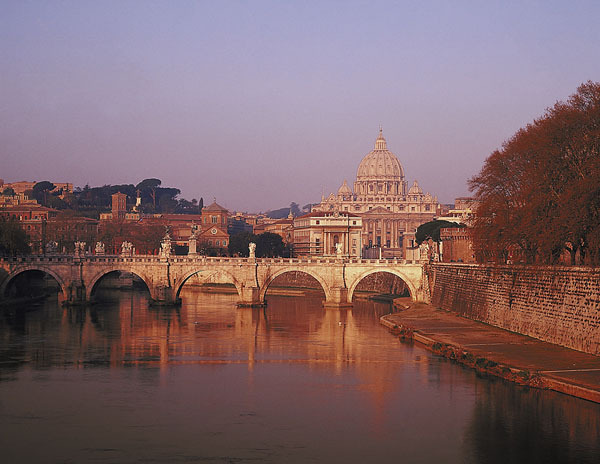 Find us at www.aav-travel.com to plan your next Italy adventure. Where are you Most Likely to Travel This Year? A new poll is up on the blog! Cast your vote and see which destination is more popular! Check back every week for a new poll question. To get the most out of your trip to Fiji, aside lounging at the beach, exploring the island and enjoying various fruity drinks, if you have the opportunity to get invited to a Fijian village–don’t pass it up. It’s an experience of lifetime to be welcomed into a village and immerse yourself in a new culture. 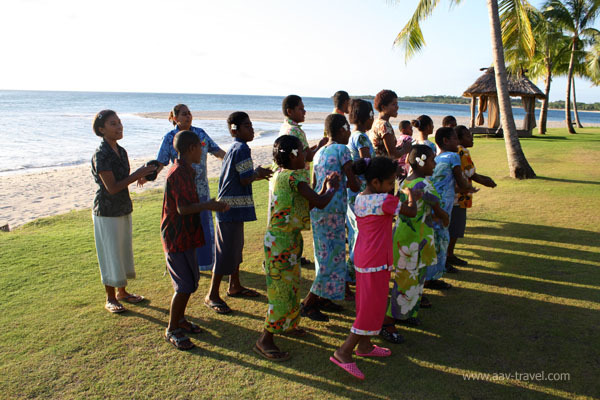 You should definitely expect culture shock; Fijian’s have very little, but are very full of life and happiness. First off, it is considered incredibly rude if you show up to a village uninvited and start wandering around. If you become friendly with the locals and they invite you back to their village, bring kava root to the Turaga Ni Koko (head of the village) as a gift of thanks. 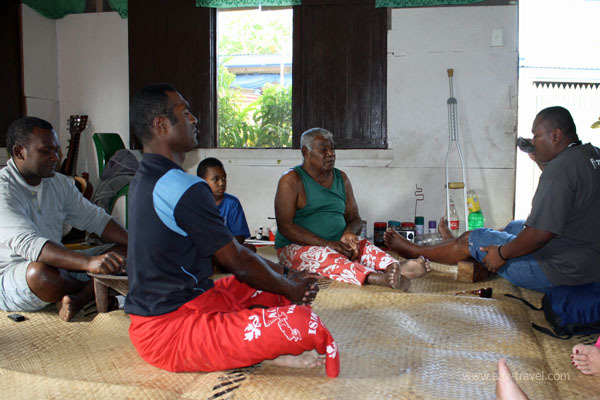 From there, your host will most likely have you participate in a welcoming (kava) ritual in the Vale ni Bose (meeting house)–meaning they accept you into their village. Many resorts organize village visits for their guests. This is probably one of the easiest ways to get to experience the village life as you will have a guide accompany you making you aware of the ceremony and its rules of respect. The ceremony consists of drinking yaqona from a coconut shell which solidifies the friendship between strangers. Sitting around the yaqona bowl and chatting is very common afterwards–it is also the best way to get to know the villagers. You’ll quickly find out that they are very curious people and will most likely ask a lot of questions and want you to take their photo. Keep in mind when taking photos: it is allowed, but remember common courtesy–ask if it’s all right to take a photo before you start clicking. When visiting a village it’s important to remember that you’re the guest and that you’re entering a new culture. What may be OK at home, may not be OK at the village. The rule for any village is to dress modestly. Proper dress for women would include below-the-knee dresses or slacks. Women should not wear shorts or walk around in a bikini and men should not be bare-chested. This is not acceptable and considered disrespectful and may have a negative reflection on the hosts. It is also considered rude to wear a hat-so either leave it behind or put it in your bag. The easiest way to make sure you are dressed appropriately is by wearing a sulu. Sulus are traditionally worn by men and women in Fiji and many resorts offer their guests a sulu as a welcoming gift. Many villages are in need of basic supplies. A great gift to bring are school supplies for the children for instance. They don’t need to be fancy. A few pencils, writing pads… it all makes a difference and is greatly appreciated. Accept the offer to stay indoors rather than to pitch a tent outdoors. It sends a message to the villagers that your hosts bure is unpleasant. Take off your shoes and place them on the doorstep. Avoid standing upright inside because it is considered bad manners. If you’re lucky enough to get invited back to a village to visit, make the most of it. 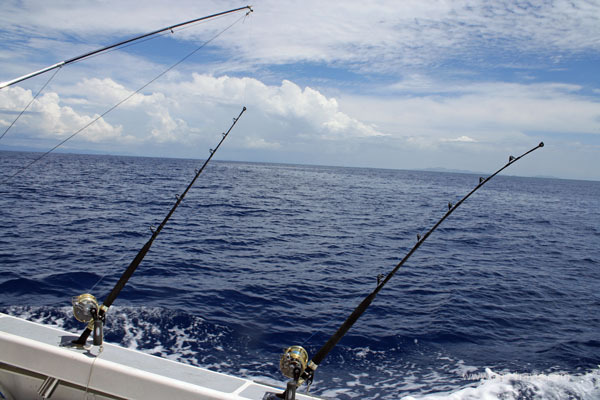 It’s a whole new experience from being on your island resort. You’ll learn to appreciate the little things in life and give you a new outlook on how people live. Fijian’s are great hosts so show your appreciation and give thanks. Located in the heart of the South Pacific, the Mamanucas are a chain of 20 islands and have some of the most established resorts in Fiji. From the Nadi International Airport (NAN), you can travel to your island destination by either ferry, private boat, sea plane or helicopter. The Mamanucas are a playground for lovers and families alike. Even though there are several adult-only islands, there are islands that are perfect for family getaways. Once you step foot on any island, you’ll be greeted by the warmth of Fijian hospitality. Majority of the population in Fiji speak Fijian and Hindi, but English is also very prominent. Bula! 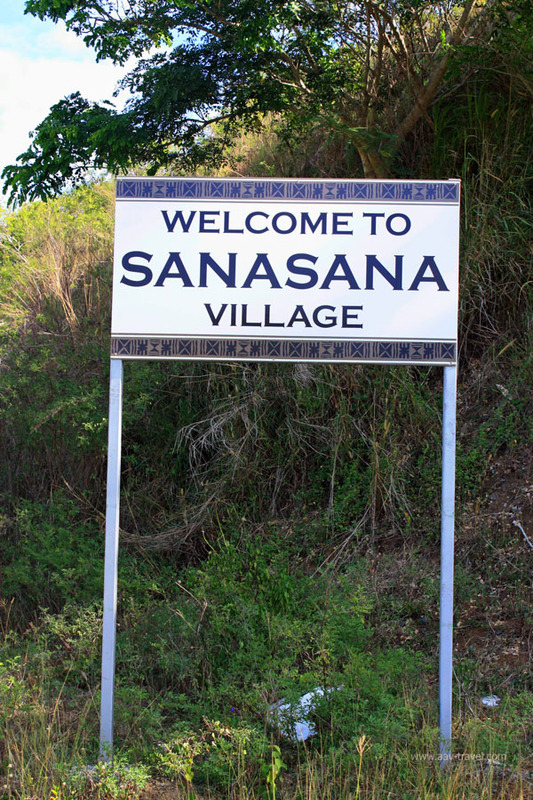 That’s one word you’ll hear anywhere you go while traveling in Fiji. It’s like our ‘hello!’ or ‘how are you?’ Pick up the habit of saying Bula in Fiji, you’ll notice that you’ll get a friendly response. Some of these activities will be included in your stay at your resort, but additional activities will be at your expense, so make sure to budget ahead of time what you’d really like to do. 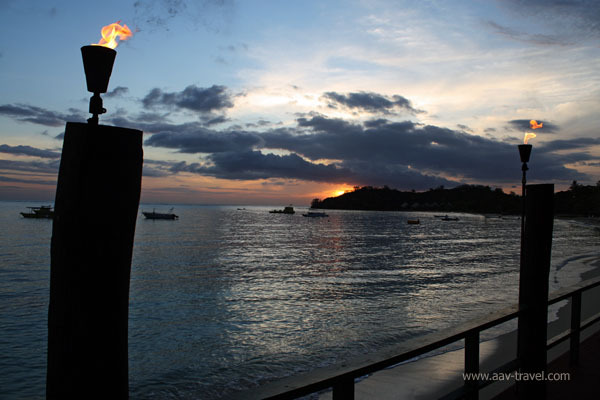 Just like the various activities on the islands, there are many local as well as foreign influences in the cuisine. 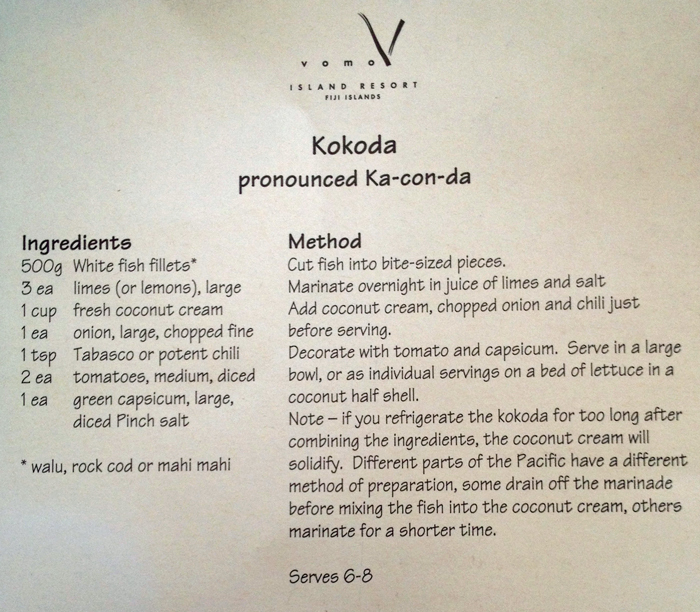 Many of the island chefs come from Australia or Asia which greatly plays a role in Fijian cuisine. One excellent chef you can find in the Mamanucas is Lance Seto who is an award-winning food and travel writer, author… currently based at Castaway Resort. No matter what chef though, you can expect to eat lots of seafood while you’re there. Though Fijian accommodations are a wide variety, whether you choose a luxurious private resort, a more modern affordable island or a budget traveler, your Fijian adventure will give you the chance to escape from the real world and transport you to a stress-free paradise. Want to travel to Fiji! Contact Stefanie at AAV Travel via email at info@aav-travel.com or visit the website www.aav-travel.com for more information. For more images from Fiji, check out photo gallery on the Facebook.